Substance dualism is an enduring theory within the philosophy of mind. According to substance dualists the mind is ontologically distinct from the body. With the rise of neuroscience in the 19th and 20th centuries, the theory appeared to become less tenable: the evidence seemed to point, overwhelmingly, toward a deep connection between mind and brain. But despite the continued presence of this evidence, a satisfactory theory of mind-brain relations remains elusive. As a result, my current sense is that substance dualism may be due to undergo something of a recrudescence. 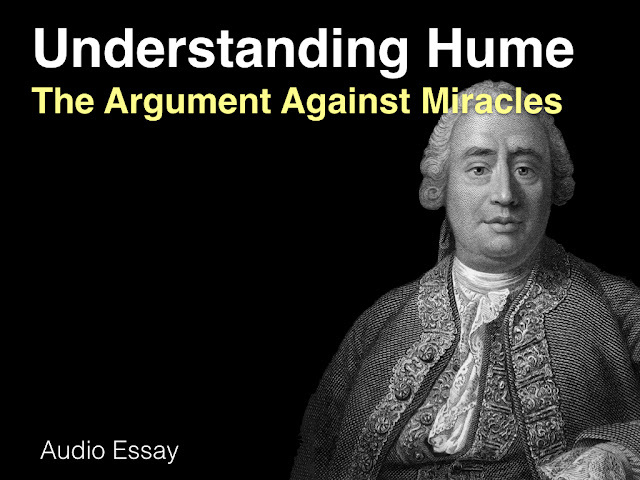 Thus, those of us with an interest in the philosophy of mind would be well-advised to understand the arguments that can be mustered in its support. Fortunately, William Jaworski, through the medium of his recent book Philosophy of Mind: a Comprehensive Introduction , is on hand to assist. I’ve mentioned and recommended this book before. 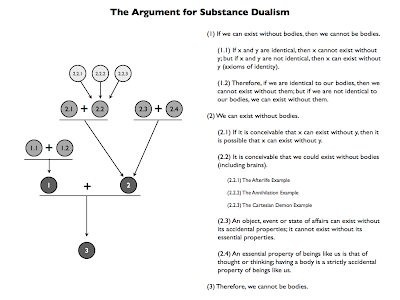 In this post, I will run through Jaworski’s presentation of the basic argument in favour of substance dualism. In future posts, I’ll consider the various criticisms and responses to this argument. (1) If we can exist without bodies, then we cannot be bodies. (2) We can exist without bodies. (3) Therefore, we cannot be bodies. 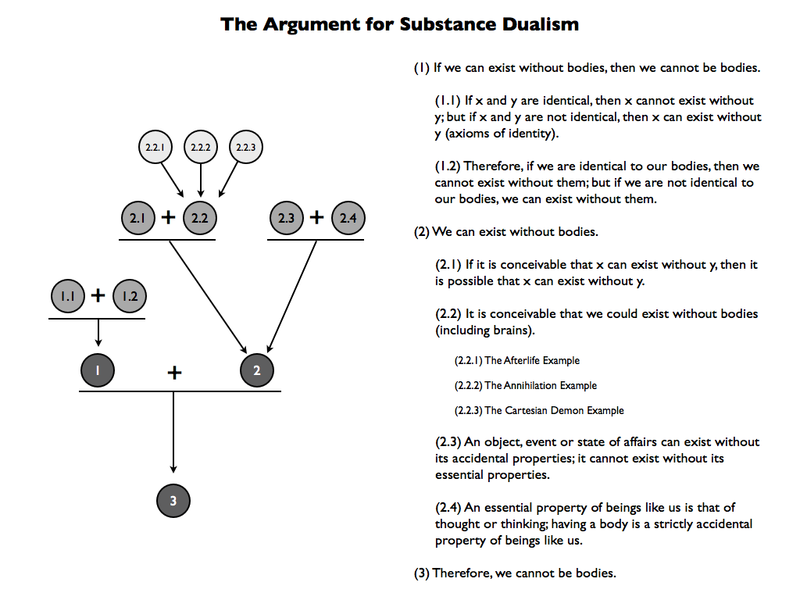 As Jaworski notes, this is often called the modal argument for substance dualism. It garners this name because it appeals directly to the possibility of a mind or person existing without a body. Possibility is, of course, a modal concept. The argument as stated is valid, but its two premises are in need of support. The first premise makes a simple identity-based claim. As such, it is relatively easy to defend it by appealing to the axioms of identity. Identity is a relation of sameness or equivalence between two objects, events or states of affairs. In other words, x is said to be identical to y, when the labels “x” and “y” can be used to refer to the same object, event or state of affairs. Thus, we can say that February 14th is identical to Valentine’s day because those labels refer to the same day; or that “Samuel Clemens” is identical to “Mark Twain” because both labels refer to the same person. So if x and y are identical, they must be the very same object, event or state of affairs. In that case, x cannot exist without y. Why not? Because to say that x exists but y does not would be to deny the identity relationship that was originally presumed. Applying this to the mind-body debate we can say the following. If, as some physicalists claim, the mind and body (or, at a minimum, a defined proportion of the brain) are identical, then one cannot exist without the other. And contrariwise, if the mind and body are not identical, as substance dualists claim, then one can exist without the other. (1.1) If x and y are identical, then x cannot exist without y; but if x and y are not identical, then x can exist without y (axioms of identity). (1.2) Therefore, if we are identical to our bodies, then we cannot exist without them; but if we are not identical to our bodies, we can exist without them. (1) Therefore, if we can exist without our bodies, then we cannot be bodies. Jaworski notes that there is nothing to really dispute in this line of reasoning. So if there is a problem with the substance dualist argument, it is unlikely to be found through a critique of premise (1). Premise (2) must be where all the action is. And there are two arguments in its favour to be considered. (2.1) If it is conceivable that x can exist without y, then it is possible that x can exist without y. (2.2) It is conceivable that we could exist without bodies (including brains). (2) Therefore, we can exist without bodies. (2.2.1) The Afterlife Example: Many people can conceive of themselves existing after they die (this is true even of those who don’t believe in the afterlife). But once they die, the physical body is destroyed. Therefore, in order to conceive of the afterlife these people must tacitly conceive of their existence without their bodies. (2.2.2) The Annihilation Example : Imagine you are watching yourself sitting reading your computer screen through some security camera feed. Now imagine that the body you see sitting reading the computer is instantaneously annihilated and you are left staring at an empty chair. You are now conceiving of yourself existing without a body. (2.2.3) The Cartesian Demon Example: Follow Descartes‘ sceptical procedure. Suppose that all your visual, auditory, olfactory and other sensory experiences are the product of a deception. By doing so, you’ll find that you can doubt the existence of the external world, including your own body, but that you cannot doubt your own existence. Thus, once again, you can conceive of your own existence in the absence of a body. There are serious questions to be asked about these examples and whether they actually establish what they need to establish. We’ll leave those to one side for the time being and move on to consider the second argument in favour of premise (2). Objects, events and states of affairs have properties. These properties come in two major forms: the essential and the accidental. An essential property is a property that an object, event or state of affairs cannot be without; an accidental property is one that it can be without. To give an example, three-sidedness is a property that a triangle cannot be without. A triangle cannot be said to exist if it only has two sides. Therefore, three-sidedness is an essential property of a triangle. In contrast, “my favourite shape”-ness is an accidental property of a triangle. Triangles presumably existed before I was born and so did not require the property of being my favourite shape in order to exist. (2.3) An object, event or state of affairs can exist without its accidental properties; it cannot exist without its essential properties. (2.4) An essential property of beings like us is that of thought or thinking; having a body is a strictly accidental property of beings like us. This argument owes its origins to the work of Descartes. The crucial premise here is (2.4). For it to be true, we need to have some reliable procedure for identifying what is an essential property and what is an accidental property; and we need that procedure to lead us to the claim stated in (2.4). Jaworski points out two methods for identifying essential and accidental properties. One is the method proposed by empirical essentialists. They believe that the essential properties of an entity can only be identified after an exhaustive empirical study of that entity. The alternative method is that proposed by conceptual essentialists. They believe an a priori thought experiment can reveal what is essential and what is not. “According to Descartes, if we want to discern the essential properties of some object, A, we start by compiling a list of all the properties we take A to possess. Suppose, for instance, that P1, P2, P3...Pn is a list of those properties. We next take each property on the list, and consider whether it is possible for A to exist without it...[If] we cannot conceive of A existing without P1, then we can conclude that P1 is an essential property of A, that A needs P1 to exist. By following this procedure for every property on the list, Descartes thinks, we arrive at a list of A’s essential properties.” (pp. 42-43, with some emendations). Following this method, we should find that having a body is a strictly accidental property of beings like us. I know I said I’d hold off on criticisms and evaluations until future posts, but I can’t help but point out that this conceptual method seems to make the essential property argument either circular or indistinguishable from the conceivability-possibility argument. It would seem to do the former by making a claim about what it is possible for an entity to exist without dependent on a set of claims about what it is possible for an entity to exist without; and it would seem to do the latter by making what it is conceivable for an entity to exist without determinative of the essential properties of that entity. To be fair, Jaworski is aware of these points, as is clear when he discusses the criticisms of the argument. I’ll look at these next time round. For now, I simply present a complete map of the argument for substance dualism. As always, click on the image to see a larger version. You are stating here a huge theoretical building resting on one false claim, namely 2.2. Since you state those examples, I assume you are regarding one or more of them as true. Let me tell you in advance: Regarding these arguments, Jaworski is stupid. 2.2.1: "Many people can conceive of themselves existing after they die..." - How did those people report about this after they are dead? 2.2.2: "Imagine you are watching yourself..." - I can imagine a pink elephant, therefor pink elephants exist?!? 2.2.3: "...are the product of a deception." - True, it is thinkable that we all live inside a matrix, or even that only I live inside a matrix, dreaming up everyone else. It is also thinkable that mice ordered the construction of earth to find the question to the answer "42". You see, being thinkable doesn't automatically mean being so. If you have any proof for a separation of mind and matter, please let me know. Until then, I only see a huge theoretical construct that immediately crubles down. I think you mistake the purpose of this post (and Jaworski's book). It is merely presenting a set of arguments. There is no hint of endorsement involved. You might be pleasantly surprised by part two. "Substance dualism is a popular and enduring theory within the philosophy of mind." Only, I think, if you stretch the meaning of "popular." Popularity doesn't (or shouldn't) decide issues in philosophy, but according to the Phil Papers survey, only 14.6% of "target faculty" specializing in philosophy of mind accept non-physicalism. Only a proper subset of those will be substance dualists (the survey didn't ask that question). Does a view count as popular in a field if, say, only 10% in the field accept it? I was thinking more of popularity among the general population not those specialising in philosophy of mind. Admittedly, this isn't what I wrote so I've just dropped all talk of popularity. I think the claim that it is popular among the general population might be defensible. I know, for example, that psychologist Paul Bloom claims we're all naturally inclined toward substance dualism. Also, I don't think I can be read as suggesting that popularity decides issues in philosophy (although, I do subscribe to jury theorems and so do think that a majority can be more likely to be right under certain conditions - those conditions may not apply in philosophy though). John: Thanks for your reply and revision. Your original opening sentence struck me as similar to saying "Creationism is a popular and enduring theory in geology." Popular and enduring among non-experts, indeed, but not among experts. I didn't read you as arguing from popularity (whether lay or specialist) to truth. Instead, I was trying to make clear that I myself wasn't arguing from (specialist) unpopularity to falsity. I failed to make that clear. I think that it a view is held by 10% of experts, it is popular enough to be worth addressing. I'd say that support from 1% of experts is enough to pass the "not ridiculous" threshold. But still, substance dualism seems ridiculous to me. I don't know how "ridiculous" comes into it; I never used that word. You say that substance dualism has ten times the popularity among experts that's needed in order to avoid being ridiculous. Yet you also say it seems ridiculous to you. In any case, a view accepted by 10% of those working in a field isn't accurately described as popular in the field. That was all I claimed. I only used the term "ridiculous" as shorthand for the point of the first two paragraphs. I inferred that these paragraphs (with the term "popular") were establishing that this idea of mind-body dualism has sufficient support among thinkers to be worth addressing. In such calculations, the opinions of experts have more weight than the opinions of others, and an idea held by 10% of experts is sufficiently popular to be worth addressing. My final comment about ridiculousness was just a snide expression of my bemusement at the range of beliefs that people hold. *Some of my own beliefs have been dismissed in this manner. "According to substance dualists the mind is ontologically distinct from the body." If that is all that substance dualism claims, then it is surely true. The existence of brain dead people shows that you have a body without a mind, and that's enough to see that they are distinct. I would have thought that substance dualism was claiming that the mind is independent of the body, not merely distinct from it.